On this date in spaceflight history, an interesting coincidence in timing occurs. Yesterday, United Launch Alliance (ULA ) launched the LightSail experiment as a secondary payload of the AFSPC-5 mission that was conducted with the U.S. Air Force’s X-37B mini shuttle. A half decade ago, the Japan Aerospace Exploration Agency also launched a solar sail of its own – IKAROS. 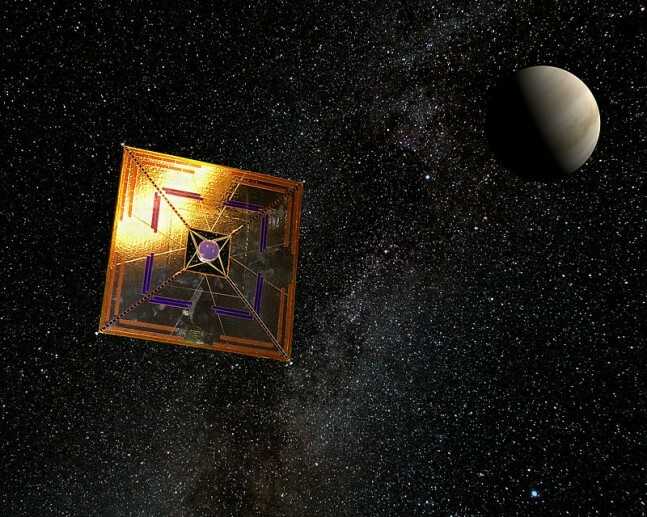 The IKAROS (Interplanetary Kite-craft Accelerated by Radiation Of the Sun) spacecraft marked the first successful flight of a solar sail in the space environment. As envisioned, the test article collected and used sunlight as a means of propulsion through its panels. With this test successfully completed, IKAROS completed its primary objective and validated the concept of solar sailing. IKAROS was launched atop a Mitsubishi H-IIA rocket; it did not, however, make its voyage alone. It was accompanied by the Akatsuki (Venus Climate Orbiter) spacecraft as well as four other small spacecraft. The IKAROS craft also demonstrated that such a design need not be viewed as fragile or short-lived. IKAROS passed by the planet Venus on Dec. 8, 2010, at an estimated distance of about 50,200 miles (80,800 km). At this point it had completed the primary phase of its mission and went into the extended operation phase. On May 20, 2015, The Planetary Society flew another solar sail demonstration craft – with plans to fly another on a SpaceX Falcon Heavy as early as 2016.